It is that time of the semester again. Exams are over, placements are wrapping up, and hopefully everyone is taking some much needed time to rest and rejuvenate. During these times we find that less of you are wanting to chat to us after hours and so we will be ending our after-hours Skype Drop In Sessions this week until the start of Semester 2. That means we will recommence the Tuesday 8-9pm sessions on 25 July and be back for Thursday nights from 27 July 2017. But don’t forget many services offer 24 hour supports including Lifeline on 13 11 14 and the Mental health Line on 1800 011 511. And of course we are still very happy to have you make an appointment if you want to catch up with someone face to face or for an individual online session. 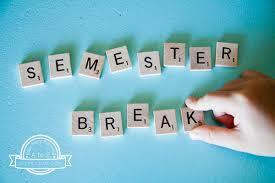 Enjoy the break if you are having one! So we’re at the end of semester and depending on what your plans are will likely mean a bit of celebrating. This might be here with friends you’ve made, while travelling during the break, or back at home catching up with people you’ve known before coming to UON. Whatever these celebrations will be its pretty likely that alcohol of some kind will be involved and there’s often some pressure to (over)indulge. The pressure may come from perceived social norms (ie. I see others drinking and want to fit in); it might come from internal motivation (ie. alcohol makes me feel more sociable and I want get to know these people better or re-connect); it might come from recognised effects of alcohol (ie. I’ve been so stressed during exams and alcohol makes me feel less stressed). Everyone has different reasons; but it’s important to remember there is always a choice about whether to drink or not to drink… and how much. I often frame this as learning how to ‘drink smart not hard’. Know your Standard Drinks: It’s the equivalent of 10g of alcohol and is the amount of alcohol the average liver can process in 1 hour. The standard drinks contained in each beverage you have varies by alcohol type and serving size. 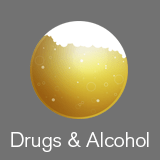 Calculate and track your Blood Alcohol Concentration (BAC): (See BAC Apps http://adesaustralia.com/free-app/; baczone.com/ProductsApp.html) BAC is a measure of alcohol content in your blood and varies due to body size, body fat, gender, liver function, whether you’ve previously drunk alcohol or eaten recently. 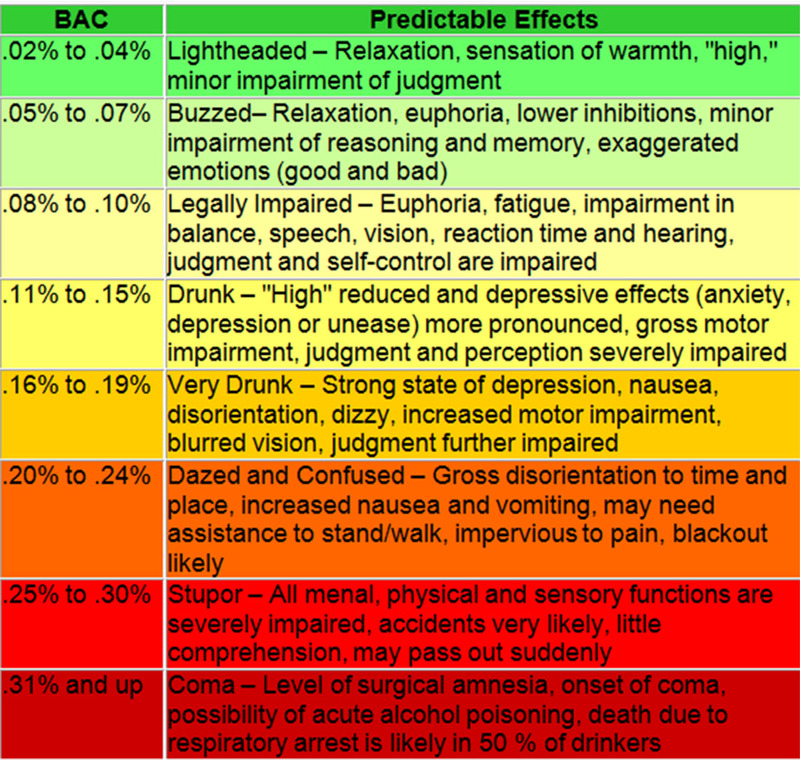 BAC helps you to gauge your level of intoxication as BAC levels are linked with levels of impairment (https://dotedon.files.wordpress.com/2015/04/bac-chart.jpg). Have a non-alcoholic drink first and then every second or third drink (‘a spacer’). Gauge the effect of each drink by allowing time for alcohol to be absorbed into your bloodstream (about 15 mins or 3-4 songs) before having another (ie. pace yourself). Avoid other people topping up your glass, as it makes it difficult to keep track of how many standard drinks you’ve had. Drink low-alcohol drinks, and avoid mixed drinks, like cocktails, as it is difficult to tell how much alcohol they contain. Avoid drinking in shouts or rounds, so you don’t feel pressured to keep up. Sip drinks, avoid salty snacks or other food that increase thirst. Remember confidently saying “no thanks” or “thanks I’m good for now” to another drink when you had enough is something people actually respect. Sometimes at this point of semester it can seem like time is very fluid. One minute you’re staring at the page thinking I have been trying to read this forever! The next you are heading into an exam and wondering where the last couple of weeks went? Often you might find yourself feeling a little overwhelmed, and as mentioned a couple of weeks ago it is important to manage this anxiety and come up with a plan. But how about the day before an exam when it all just seems so BIG or when you actually are driving to the exam or sitting waiting to get started in the room? Emma introduced some ideas to help cope with the intense anxiety that often comes up at these times and I thought this week might be a good time to re-visit some ideas from one of our tipsheets. Grounding techniques are quick and easy strategies to help you stay calm and reduce stress, anxiety or panic. They keep you ‘grounded’ in the here and now, the present reality, and allow you to connect with what is really going on rather than getting caught up in thoughts and worries about the past or future. There are some really easy ones like counting to ten or stamping your feet on the ground. Then there are those that will take a little more time like using visual imagery or keeping a journal of your thoughts, feelings and observations. Here are a few that you might find useful when preparing for an exam or even sitting in the exam. Often they can be done without others knowing you are doing anything at all. These techniques don’t work for everything but they can be useful in some situations. If you feel like you are becoming stretched in the final days of study or if you become overwhelmed by anxiety in the exam, or anywhere stressful, try something to bring you back to the ground. It is that time of year when taking care of yourself seems just that little bit harder. What with exams and study and assessments and placements and now it is winter! Seasonal Affective Disorder is a term some of you may have heard and perhaps wondered about but even without the diagnosis I know for me the colder nights and shorter days means that enthusiasm to do things is so much harder. Especially when you have to do things that are not fun (like study) getting motivated to start, let alone keep going, sometimes seems impossible. While sometimes there may be hours, days or weeks when getting through the day feels hard, this is normal. Sometimes life causes pain and hurt and struggle and mess. As humans it is OK that we feel that pain, hurt, struggle and mess. But what is so very important in those times is knowing how important it is to take care of yourself and so having some ideas on how to do this may be helpful. So with that in mind I thought it might be a good time to offer up some seasonal, exam tips for self-care when you’re feeling low. 1.Check in with your expectations. Are you expecting too much from yourself given all the things you have happening right now? 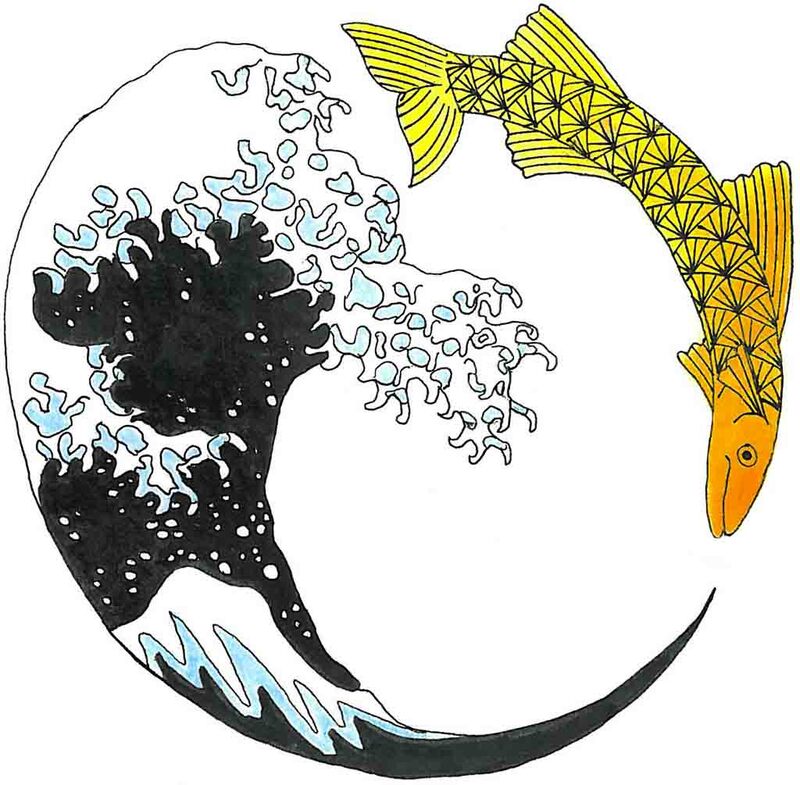 I encourage you to look at yourself with a gentler eye, let go of any ideas you have about being ‘good enough’ and instead ask ‘what is reasonable’? 2. If you were talking to a friend who was feeling like you what would you say to them? This follows from above and can be helpful if you are feeling like it is all too much. Imagine you are your own best friend. Offer yourself comfort and empathetic words of encouragement. 3. 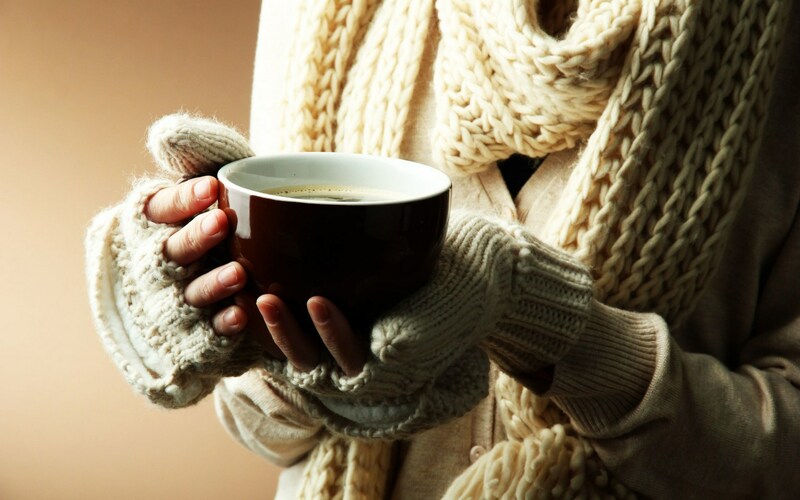 Speaking of comfort, what could you do to bring comfort to your day today? How about a coffee in the sun? A drive to the beach and sitting looking at the rolling ocean? New sheets on your bed? Some hot buttered toast? You can also practice gratitude in these times to aid your experience. 4.Have a warm shower and spend some time being mindful of the water as it cleans you and renews your body. Recognise where you are holding stress or tension and move your body to stretch those aches. 5.How about a bath, if you have one pop yourself in with some bath salts and your favourite book or music. 6.Go outside and walk in the weather. Whatever the weather. If it is sunny bask in the warmth of the day. If it is windy wrap yourself in a scarf and coat and look at the clouds as they move or the trees as they drop their final leaves. If it is wet, don’t be scared, you won’t melt! Just pop on some boots and a raincoat. Find a puddle! 7. Reconnect your mind with your hands. We have all seen the mindfulness colouring books but how about knitting, baking, drawing, gardening, tinkering on a project? 8. Make a list and a plan for today or tomorrow or the week. Leave the high expectations out and ask of yourself only what is necessary or will bring joy. If it serves neither than leave it alone for a time when you feel stronger. 9. Try taking a break from technology. Try an hour, or a day. It is amazing how re-connected you can feel by not being connected! 10. Lastly reach out for support if you need it. Don’t be afraid to talk to someone and ask for help. If you’re not sure where to start then try booking in to meet with a Student Support Advisor here at UON so you can have a confidential chat with someone who can talk through some ideas and help you get back where you want to be. This is really important if you have been feeling this way for more than 2 weeks. These are just a few ideas that you may want to try if you are feeling the exam or winter blues, remember they may be something that sounds OK or you may have your own ideas about what helps. Use your own values and self-awareness to trust yourself to create your own ideas for some self-care. Deem yourself worthy enough to try putting those ideas into practice and choose something you can have a go at today. Just a note that due to the Public Holiday on Monday 12 June there will be no Skype Drop-in on that day.The next regular Skype Drop-in is Tuesday at 8pm. 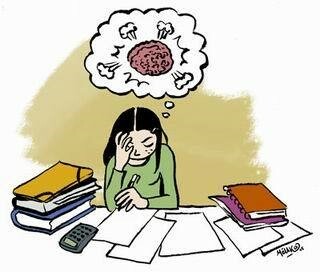 Exams are coming up and that usually means that students start to feel stressed, anxious and a little overwhelmed. Feeling some degree of anxiety and stress is natural when it comes to exams. This type of anxiety can actually be beneficial. If you can harness that energy, it can help you perform better! If you haven’t already, start studying now. It is so important that you start to manage your exam stress before the exam period. Think about what the next few weeks look like… What do you have coming up? This may include social events, work commitments and continuing to attend class. Where can you allocate time to ensure that you have time to study and revise for your exams? It is best to make a study schedule now, to make sure you are not cramming in the couple of days leading up to exams. A little bit each day NOW, leading up to your exams, will mean you are not stressing and cramming in the couple of days before. When you are stressed you may feel irritable, have trouble sleeping or you may lash out at the people around you. It might be helpful to tell family or friends that you are currently doing exams so they understand you may experience some stress or anxiety. It is also important to ground yourself and to find opportunities to relax each day. Studying and cramming 24/7 is not going to help in this situation. A good strategy is to study for a period of time, usually 45 minutes to an hour, with a plan of what you want to cover in that time. Then take a short break to unwind and relax and come back to study later. The aim is to follow a study plan, and when that has been achieved you reward yourself and then come back to it at a later time with a fresh perspective. Some suggestions for from other students include going to the gym, taking a walk, grabbing a coffee with a friend, or simply turn on some music. Feeling overwhelmed at this time of year is completely understandable. Along with finding time to relax during the day, is also ensuring you are able to wind down at night and get a good night sleep. 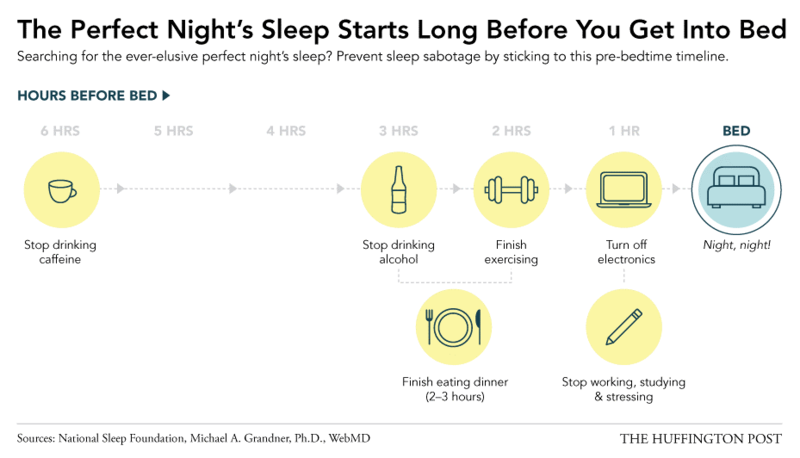 This doesn’t mean you have to go to bed at 7pm every night, but simple things like not watching Netflix until 3am will help. You may also want to consider not using your phone for the 1 hr before bed – Facebook can be checked tomorrow! The night before your exam, you will have all of your revision notes done, and you will not be cramming, right?? If you follow these strategies, you will do great! The night before, look over your notes before dinner and then enjoy something nice and healthy for dinner, try and avoid alcohol. It is important to acknowledge and accept the uncomfortable thoughts feelings you may have leading up to and during the exam. If you ignore them, they can become worse. Remember, these feelings will pass. Acknowledge the sensation and then focus your attention on your breathing, or your feet on the floor and say to yourself, “Its ok. I can do this”, then return to undergoing the exam. For more information about how to remain calm during your exam, check out the Exam Anxiety Tip Sheet.